Fleetwood Town boss Joey Barton hailed Dean Marney after the midfielder’s first goal for the club set them on their way to a 3-0 win over Coventry. The 34-year-old was recalled to the starting line-up for the first time since the 1-0 defeat at Peterborough last month. And Marney broke the deadlock in the 54th minute before goals by Wes Burns and Ched Evans clinched the win. 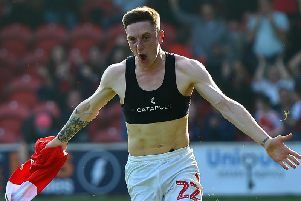 And Barton, who played alongside Marney in the Championship and Premier League, feels Town have a different player now he has regained full fitness and resolved family issues. Barton said: “I played with Marns in the season we won the Championship at Burnley and in the Premier League. He’s an outstanding footballer. “The difficulty for him when he came in was that he was a little bit behind after missing part of pre-season. “He played in lots of the games but I felt he could make more of an impact. “He had a few things rumbling on away from football but they have sorted themselves out for the better, which is fantastic. “He just looks a different player and first half I thought he was very good. “I could see (in training) he is going to start performing but he has been unfortunate because the lads in there have done well, Shez (Nathan Sheron) and Holty (Jason Holt). He has been waiting for an opportunity and I thought he took that. Barton made six changes, combining Marney and Wallace in a new-look midfield partnership, with Craig Morgan, James Husband, Conor McAleny and Wes Burns all brought in. Ash Eastham went off in the 51st minute due to a stomach bug and Barton praised his replacement Cian Bolger. He said: “Cian Bolger had a long period without playing a lot of games and now has had a quick turnaround. He has had to recover being such a big lad. “And with the captain Morgs being back to full fitness and champing at the bit, we have great competition. “Cian gets a 30-40 minute run-out because Ash has a bit of a tummy upset, which is strange but it does happen.